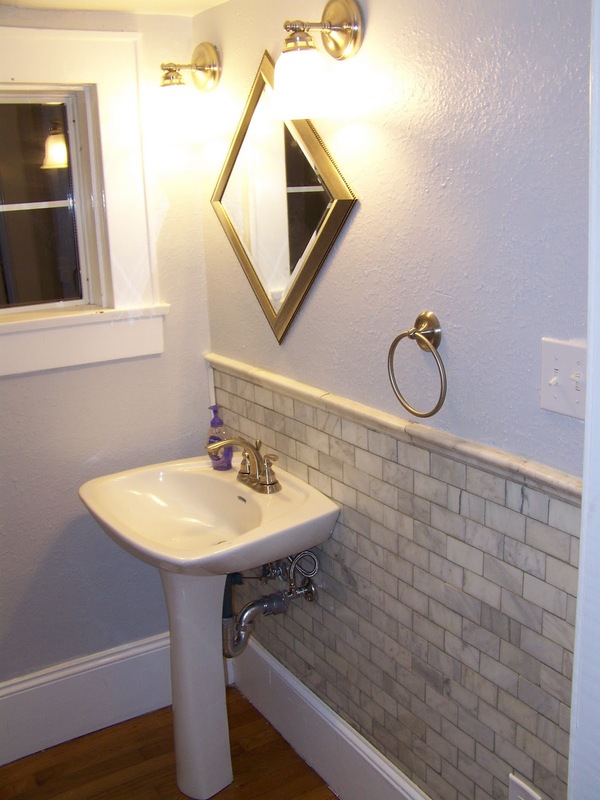 We had painted, grouted and installed the lights. 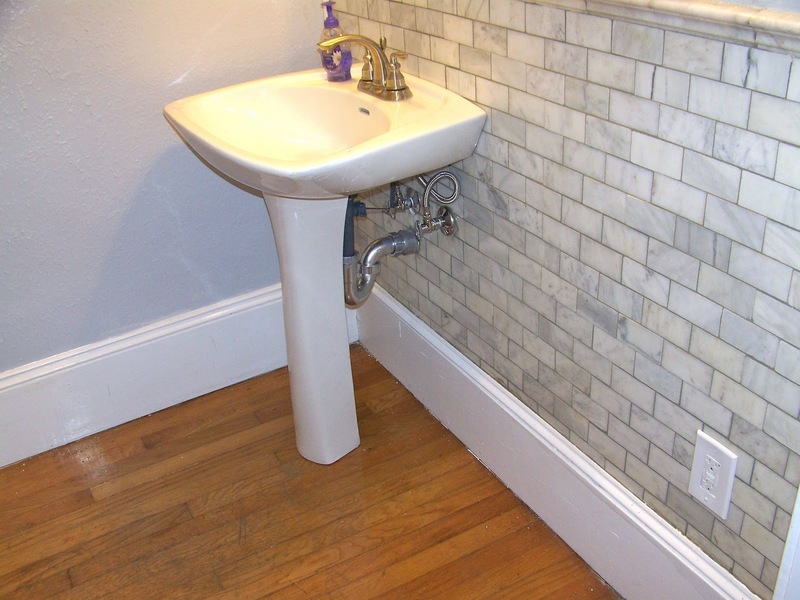 The next day we wer able to drill through the tile to put on the wall mount for the sink, attach the plumbing, install the toilet, and attach some accessories. 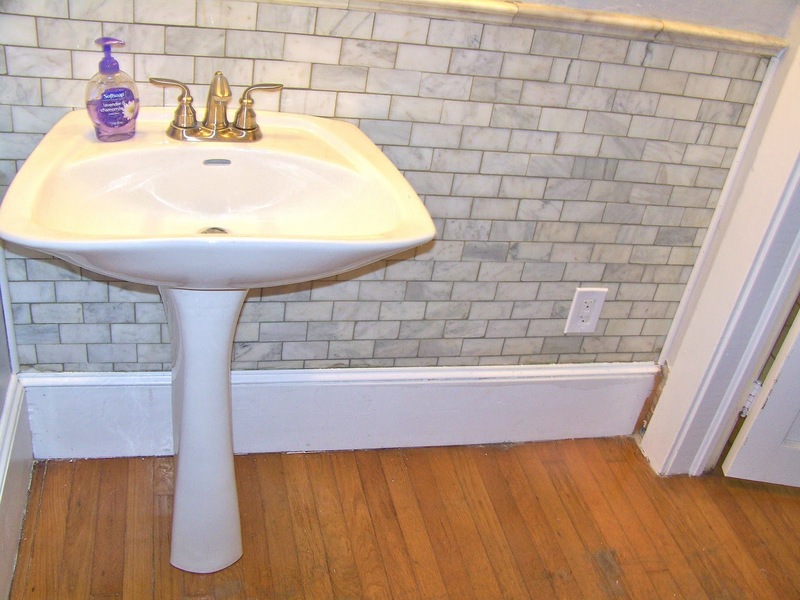 We reused the sink and toilet from the old bathroom because they were in really good shape. We did change out the faucet though. Initially we bought a new one, but then Nate remembered that my cousin had given us a faucet a few years back that wasn't the correct size for our old vanity. 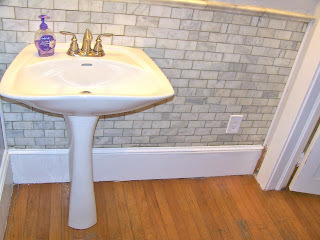 It was however the perfect size for this sink, plus it made the move, plus we were able to find it in the mess of stuff in the garage that hasn't found a home yet! So the bought faucet went back to the store. This was pretty awesome since I had budgeted between $100 and $200 for a new faucet so that really helped keep costs down. 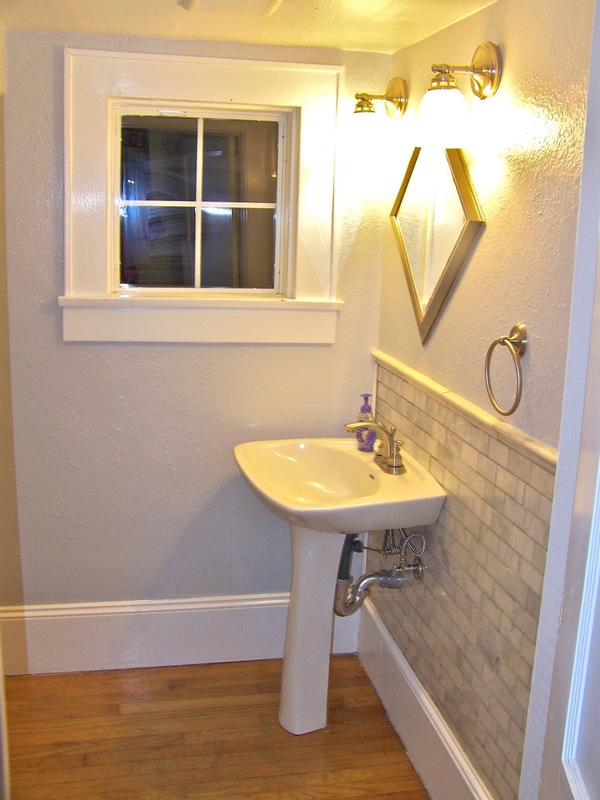 Notice that the outlets and switches are now all installed (and it is a nice gfci protected bathroom now) and the lights are on (yes you can ooh and ahh). It did take a few tries to get the plumbing all set. Since we drained the pipes, when we turned the water back on some grossness in the lines kept clogging the faucet and supply lines. We ended up replacing the old supply lines with nice new stainless steel supply lines. We also had to fix a few leaks but now it is super dry and awesome! For the toilet we got a new wax ring and new bolt caps and screws (because half of the old ones disappeared during the renovation). Then it was just getting everything set up, carefully placing the toilet on the wax ring and bolting it down and attaching the supply line. We also got a new stainless steel supply line for the toilet so everything would match. This last pic also brings us to the accessories. We got a new toilet paper holder that matched the brushed nickel of the lights and the faucet. We also got a matching towel holder. The mirror was a little unexpected. We were planning on using a mirror we already had but it was just too big to fit in the space. 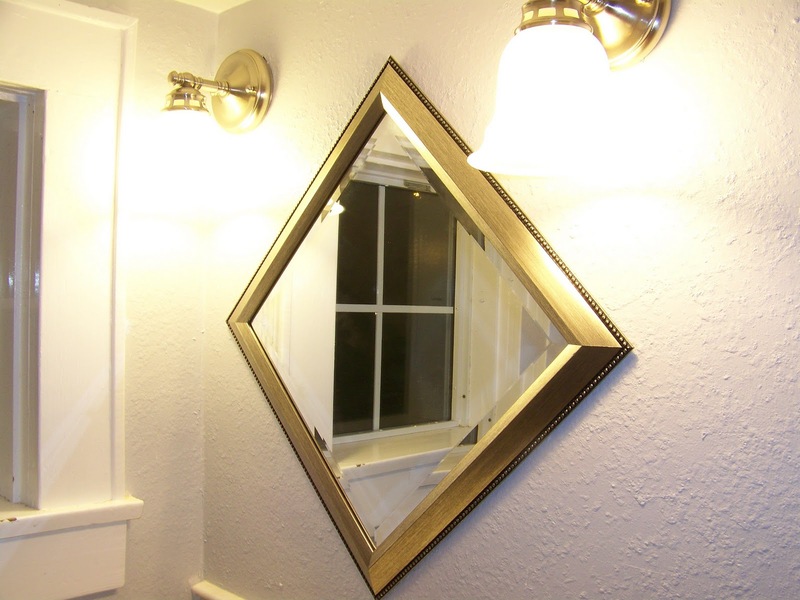 I spent a really long time looking for a mirror that I liked, was reasonably priced (generally those two things did not go together) and would fit in the space. After searching Etsy, Marshalls, all my favorite thrift stores, Amazon and countless other places, we finally found some great mirrors at Big Lots. 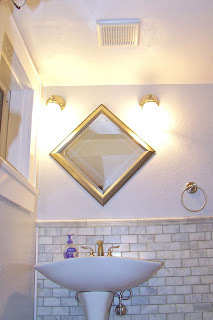 We were actually going to get a different mirror, but then We found this one. I was on the fence between the two until Nate suggested hanging this one so that it was a diamond instead of a square. That sold it for me. Plus at $15 vs. the other at $40 made the unexpected purchase much more appealing. I really love how perfectly it fits in the space. For a short moment we considered painting it to get some color in the space, but the silver looked so good we decided to leave it (and we're getting color in the room in other ways). It's so nice to have the half bath back up and running. Even though we only moved it to the other side of the wall it feels so much more accesible. 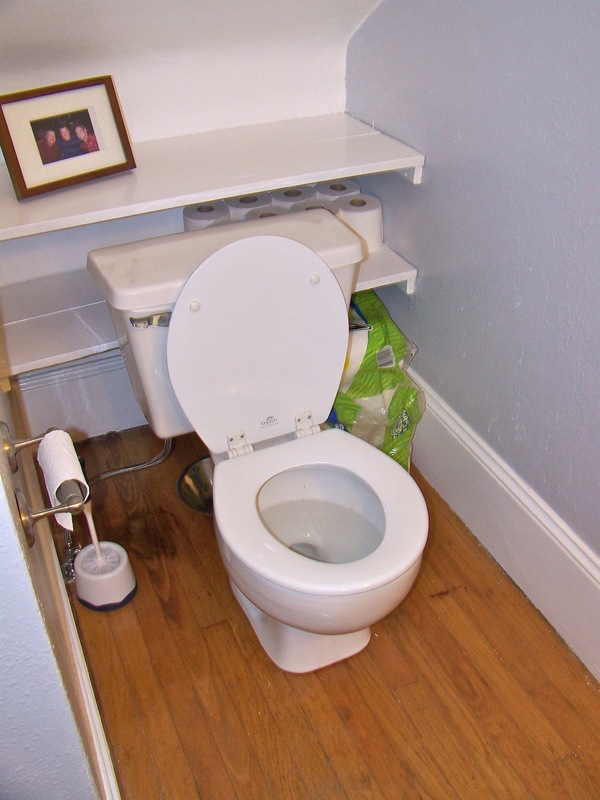 Plus this space is so much bigger than the old bathroom. No more scooting around the sink to get to the toilet for us! Up to this point the base of the bathroom is done. Next time you'll get to see it all finished and you'll get to find out how we did on the budget!